We got word of some new features at Perfectmatch.com. The first one is called "Like It" and it allows members to tell other members if they liked one or more of their photos, personal statements, and the "In My Words" content section. What makes "Like it" personal is the ability to tell the member why you liked the photo or other statements. For example with photos you can select from 6 preselected answers which include telling them you liked the energy of the photo, too their eyes or smile. Once you tell someone you have liked a part of their profile an email message will be sent to them, informing them of this connection. Another new feature is a quick compare tool. 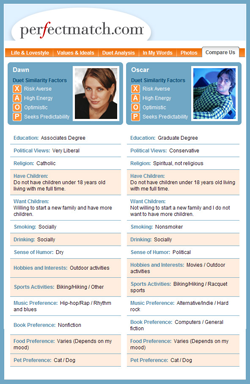 When you click on "Compare Us" when looking at a profile you will be presented with a 2 column layout showing on the left the person you are interested in and on the right your own profile details. This includes a photo, the Duet Analysis showing the Similarity Factors as well as the main parts of the profile that can often be deal breakers in a relationship. Some examples include smoking, drinking and food preferences. Perfectmatch.com also launched a revamped dating guide called "Life, Love and Dr. Schwartz" which offers a column from their relationship expert, Dr. Pepper Schwartz, as well as content from members including dating disaster stories and their favorite date night recipes. This is also where you go to find the latest Polls and Quizzes on love and relationships. Online safety tips and advice is also available from here as well. To find out more information about this dating site, read our review of PerfectMatch.com.